Venture to the far-east and turn your hand to some eastern magic in this Oriental 5 reel slots play adventure. Get to grips with the floating Wild and scatter symbols to win your free spins and fortunes. NetEnt has long been one of the leading game developers for some time now and this is evident in their broad range of online slots games that they constantly deliver. In addition, NetEnt has a knack of creating both atmospheric and engaging games that started when they began their journey 20 years ago as pioneers of the gaming market and continues to the present day. 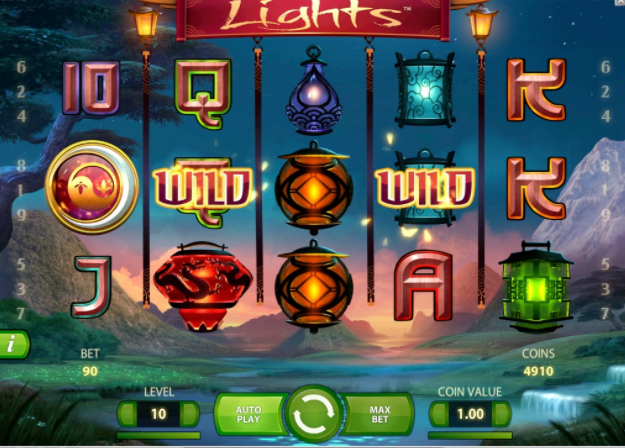 Lights slots game is their latest contribution to the gaming world, and it’s definitely not one to be missed. In an online gaming climate that’s constantly changing it’s important to take advantage of the innovations that are on the market without losing the overall quality of the game. Many developers have sometimes been guilty of overly complicating their games, however, Lights sets the tone for a series of simplistic yet contemporary, making players want to play UKs best slots such as this one. You can enjoy 5 reels and a total of nine paylines; this may seem like a slight drop compared to the usual 25 payline structure but you can be assured that this goes unnoticed once you’re captivated by the 3D graphics and atmosphere of this game. Why not try out the free mode of this game before playing for real and adjust yourself to the differential payline structure and the added features of Lights. Standard betting structures apply to Lights, place bets for as low as 1 penny per line all the way up to a maximum of £90. Taking all the paylines into account this varied betting structure allows for added flexibility and budgeting across your gaming experience. There are many Asian and Chinese themed games currently on the market and no doubt you will also have your favourites. In respect of this Lights can safely be pigeonholed as one of the best of the genre because of its atmospheric hilltop background and highly detailed, warm symbols. Enjoy the background of mountains and a rich sunset and absorb the symbols as you spin through the reels on this wonderful game. Apart from the Chinese letter symbols, you can also match up various hanging lantern symbols in return for some cash rewards. Enjoy the free spins bonus game that can be accessed by matching the Yin Yang scatter symbol 3, 4, or 5 times to receive up to 30 free spins, respectively. Think of the possibilities when you’ve got 30 free spins. This game is detailed and attractive in its aesthetic but simplistic in its gameplay. This shouldn’t be taken as a negative aspect of this game, though, because who doesn’t like a few free spins now and then. NetEnt has done a brilliant job at cementing Lights as being one of the leading games in its genre. It’s simply hard to look past the game’s extraordinary, sultry appearance and this is what perhaps draws a lot of gamers in. If you’re a relatively new gamer or one of experience the free spin bonus game that can be played when you play Lights is something that would appeal to all. For these reasons, alone Wizard Slots gives this game a rating of 9/10. Another great game for you to try is our taco brothers slot.